Anne was born in the reign of her uncle Charles II, who had no legitimate children – though it wasn’t for want of trying. Her father, the brother of Charles II and later to become James II, was first in line to the throne. His suspected Roman Catholicism was unpopular in England, and on Charles II’s instructions Anne was raised as an Anglican. Her father openly converted to Catholicism in 1675 and the scene was set for a massive political problem when he became king. 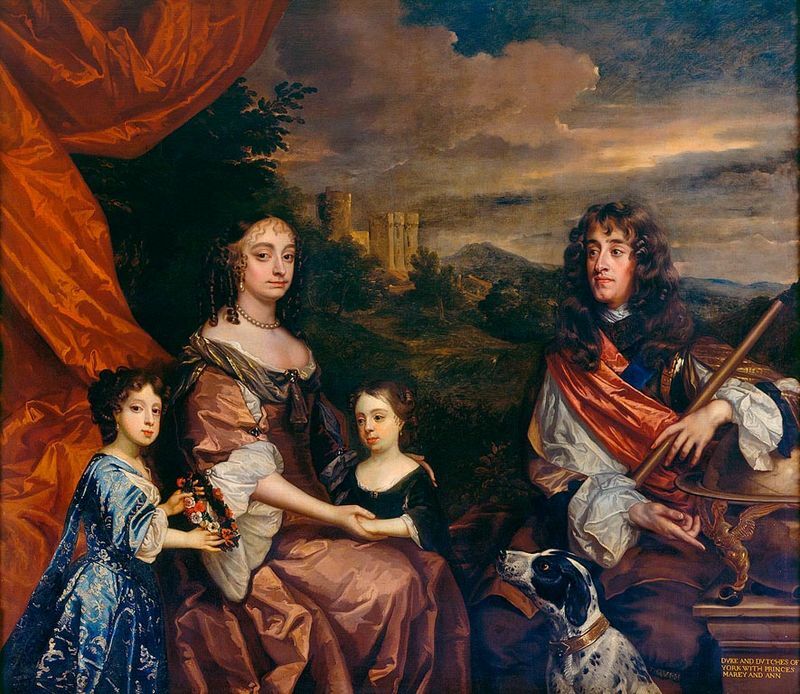 Anne (centre) and her sister Mary (left) with their parents, the Duke and Duchess of York, painted by Sir Peter Lely and Benedetto Gennari II. Their father went on to become James II and was extremely unpopular, given that he favoured a return to ‘absolute monarchy’ and was the first openly Catholic king of England in the post-Reformation period. Both of his daughters were raised in the Anglican faith. Three years after he succeeded Charles, James was deposed in the “Glorious Revolution” of 1688. When Mary died of smallpox in 1694, William continued to reign alone. 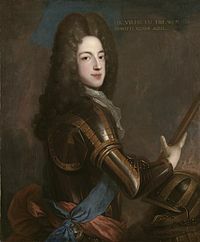 William III was succeeded by Anne upon his death in 1702. When Queen Anne of Great Britain died in 1714, she was the last monarch of the House of Stuart which had succeeded the House of Tudor with the death of Elizabeth I in 1603. Anne was plagued by ill health throughout her life. From her thirties onwards, she grew increasingly lame and obese. Anne Sophia 12 May 1686 at Windsor Castle 2 February 1687 at Windsor Castle or Whitehall Christened by the Bishop of Durham, with Lady Churchill one of the godmothers; styled “the Lady Anne Sophia”. Miscarriage 20 September 1696 Luttrell said Anne “miscarried of a son”. 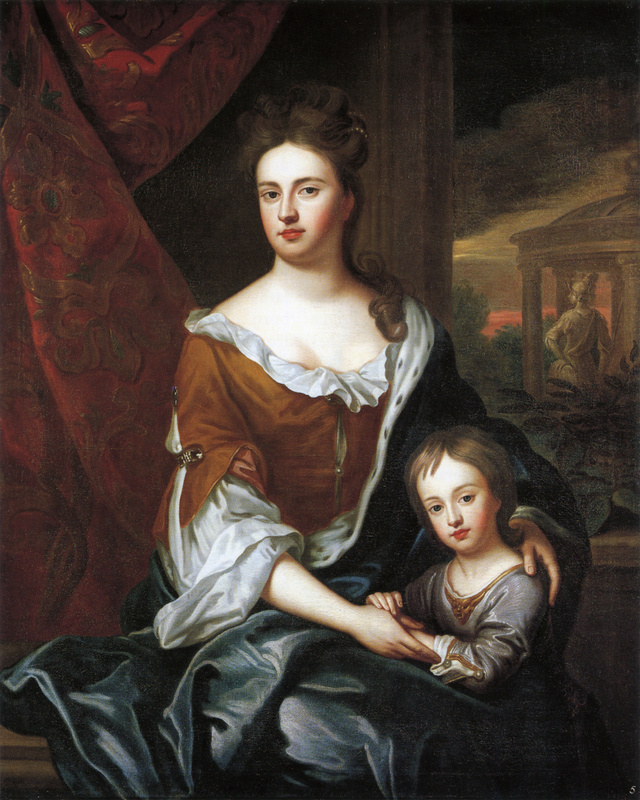 Dr Nathaniel Johnson told Theophilus Hastings, 7th Earl of Huntingdon, in a letter dated 24 October 1696, “Her Royal Highness miscarried of two children, the one of seven months’ growth, the other of two or three months, as her physicians and midwife judged: one was born the day after the other.” If so, the smaller foetus was probably a blighted twin or fetus papyraceus. Prince William, Duke of Gloucester (24 July 1689 – 30 July 1700), was the son of Princess Anne, later Queen of England, Ireland and Scotland from 1702, and her husband, Prince George, Duke of Cumberland. He was their only child to survive infancy. Styled Duke of Gloucester, he was viewed by contemporaries as a Protestant champion because his birth seemed to cement the Protestant succession established in the “Glorious Revolution” that had deposed his Catholic grandfather James II the previous year. Gloucester’s mother was estranged from her brother-in-law and cousin, William III, and her sister, Mary II, but supported links between them and her son. He grew close to his uncle William, who created him a Knight of the Garter, and his aunt Mary, who frequently sent him presents. Gloucester’s precarious health was a constant source of worry to his mother. His death, in 1700 at the age of eleven, precipitated a succession crisis as his mother was the only individual remaining in the Protestant line of succession established by the Bill of Rights 1689. They were also very concerned that the vast majority of Irish Catholics, although militarily and politically defeated, remained loyal to the ‘old religion’ and dreamt of a Jacobite invasion, consequently leading to a return to power of the Catholic peers and bishops. The Act of Settlement, drawn up in 1701, settled the succession on Sophia of the Palatinate, Electress of Hanover, and the heirs of her body, barring any Roman Catholics or spouses of Roman Catholics from the succession. This was a deliberate attempt to disinherit Anne’s nearest blood relation, the exiled Roman Catholic James Stuart (who would later be known as the ‘Old Pretender’), her half-brother, from inheriting the throne. The Act of Settlement changed the course of British history and led to the Jacobite Revolt. To show how each person’s claim was derived, their ancestors back to King James I (and VI of Scotland) – the first to occupy both thrones – are listed, without numbers. Eligible Protestants according to the Act of Settlement are noted in italics. 1: James Francis Edward Stuart (1688–1766): Claimant from 1701 in opposition to heir designate George I Louis, Elector of Hanover. No less than 55 Roman Catholic’s had a more senior lineage than the first potential Protestant successor at the death of Queen Anne. This had huge political implications for the future of the British monarchy. Very nice to see this interesting list here – such a good illustration of just how artificial teh Hanoverian succession must have felt both to Britons and otehr Europeans at a time when such genealogies were the stuff of everyday politics, and therefore much better known than we would assume nowadays. Allow me to suggest just a tiny correction – Henrietta Maria of Brunswick (or Hannover, as this is how her father had effectively been called duke of in his lifetime, and outside formal documents), whom you list as Nr. 52, was no longer alive in 1714, as she had already died at Paris on September 4, 1687 (cf. Detlev Schwennicke, Europäische Stammtafeln, Neue Folge, I.1, 25, or for example also the mention of this in her cousins letter of Sept.5, 1687 [Madame Palatine, Lettres françaises, ed. Dirk Van der Cruysse, Paris 1989, p.73f.]). The number of people whose birthright to teh British throne was better than George I’s in 1714 is therefore reduced to 54, unless of course one assumes that Princess Louise of Salm (born 1672, she was the elder sister of nr.26 and became a nun at Nancy; her date of death is uncertain, and I have seen her described as having died in 1707 or 1737, both without sources) was still alive at that time. Best wishes, Leonhard Horowski.